This Pumpkin Pie Spice Granola not only tastes fabulous but your house will smell delicious too! 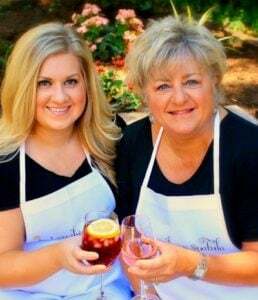 You can serve this to your family or put in pretty packages for a great gift! My obsession with Pumpkin continues – and it ain’t over yet folks! I got more comin’ up after this! I’ve been making homemade granola for years. I love it mixed in my yogurt and it makes great gifts when put in little cellophane bags or Mason jars. The store bought stuff is just too high in fat and sugar. This granola is a less sweet variety. The pumpkin puree provides the moisture and the brown sugar, honey and maple syrup sweeten it up. 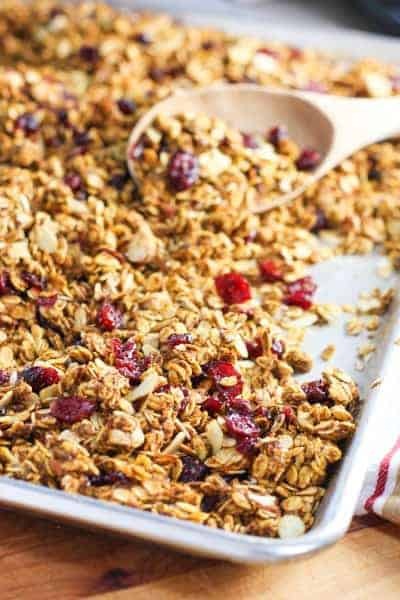 The flaxseed is flavorless but adds that heart healthy touch you expect from a good granola. Make sure and get ground flaxseed. Whole flaxseed will just go right though with no fiber results whatsoever. Dr. Oz said so, so I know this to be true…. You can use most any whole oat for this recipe. I got mine at Trader Joes – Simply called Trader Joes Rolled Oats. It’s a big old bag for super cheap. I’ve also used Bob Mills Mulit Grain Cereal. It has several kind of oats and grains in it. Wheat germ can be substituted for the flaxseed or you can omit completely – it won’t change the outcome of the recipe. Makes lots so you can share! Need more pumpkin in your life? Try Pumpkin Cheesecake Bars or Pumpkin Cinnamon Duffins! 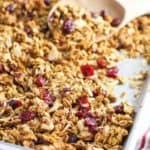 Mix all ingredients except dried cranberries and toasted nuts on a large baking sheet. Mix really well - at first it might seem a bit dry but keep on digging deep and mixing - it will come together to form a slightly moist mixture. If you can't get there...add a bit more pumpkin puree. Bake for 40 minutes, stirring occasionally. It should be slightly moist to the touch when you take it out of the oven. It will crisp up as it cools. This pumpkin granola looks super good. Beautiful picture!